It is the stuff of garden romance to discover you are the owner of a magical lost garden, especially when that garden comprises 2.8ha of buried rock gardens, pools and grottoes. Something of a shock, too; even a mixed blessing. 1 – A fern-encrusted passageway leads to the subterranean areas of the site. Rocks and Pulhamite were used in the garden’s construction. John Harris was a farmer who diversified into developing and running two golf courses on part of the old Dewstow Estate in Monmouthshire, on the English-Welsh border. In 2000 he was able to buy Dewstow House, which had originally belonged to the estate and now became the Harris family home. The Harrises were aware that the gardens had once been regarded as special, but there was no sign of anything remarkable at that time. This was not at all surprising, considering that 1,000 tons of spoil from a nearby road development had been dumped and spread over the garden area during the 1940s and 1950s. It was not long, however, before the family began to uncover the hidden gardens. The gardens John and his family began to unearth were originally made in the Edwardian era, when Dewstow was owned by Henry Oakley, a director of the Great Western Railway. He had two great interests; breeding shire horses and collecting plants. When he bought the estate in 1893 he upgraded the relatively modest farmhouse and employed the firm of Pulham and Son to create a garden for his ferns, tropical flowers and other plants. Pulham’s specialty was the creation of fantastic rockwork, using natural stone if they could obtain it, but where it was scarce, making their own from heaps of strategically-placed rubble which they then faced with cement, and called Pulhamite. Their reputation was built on the ability of the rock builders to mix the cement and sculpt the surfaces to realistically simulate natural stone. Would we admire such a process today if someone were making huge rock gardens and grottoes in this way? Or would it be seen as unbearably unnatural and a sort of ‘Blackpool’ of gardening? The patina of history adds the essential element that enables us to admire and see it all as great fun. 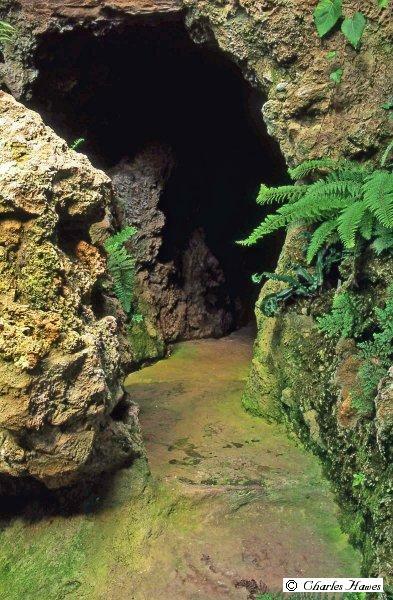 Several gardens that Pulham and Son created are still around to be seen, but I think no other has the amazing underground work that was discovered at Dewstow. The garden is the most important Pulham site in Wales, and was given a Grade I listing by Cadw (a division of the Welsh Assembly, responsible for conserving the historic environment: `cadw’ is a Welsh word meaning ‘to keep’). On the surface there was a series of six large pools, fed by a massive pumping system; a woodland ravine with dramatic waterfall, glasshouses, a stumpery, and dovecote. But underground, Pulham and Son excelled themselves. A series of tunnels, caverns and grottoes was created, some with Italianate fountains or balustrading, some covered and gloomily dark, others with glass roofing for light and protection. Water streams through it all, creating flickering reflections on the walls around – and treacherous paths that in modern times pose a dramatic health and safety challenge, since this garden is now open to the public. Some of the more adventurous stream crossings have to be closed off in this, our more safety-conscious era, and having exploring visitors is a source of understandable anxiety to John and his family. The whole experience was probably designed to climax with an enormous tropical glasshouse, the structure of which has sadly long gone. Whether the Harris family will ever be able to restore this amazing structure is a question every visitor asks, and one which nobody can currently answer. Planting this labyrinth was a challenge to head gardener, Sandra King. Although many plants grow in sheltered, underground conditions, there are vicious and unpredictable draughts; where airflow is restricted, pests and diseases cause problems. There is also the perennial question with a historic garden – how to plant it? Should it be `Edwardian’ (there are few archive pictures to give clues) or would that be simple pastiche? Should it echo the original colourful plantings or should the current preference for a more naturalistic style prevail? Caves, rock pools and grottoes are, after all, imitations of wild landscapes. At the same time they conjure up an alien, dreamlike atmosphere rather more than echoing the caves and streams of the Wye Valley. Dream or natural? Edwardian or 21st century? Sandra’s predecessor came from a background in local authority gardens which inclined her to more traditional, showy planting styles, both under- and overground. The current owners are not experienced gardeners and have no background that would have prepared them for the challenges of restoring and opening a garden to the public, and their wish has been to make the garden colourful and varied. Sandra, however, found herself troubled by these para­meters and has chosen to adopt a more `natural’ planting style, while managing to provide theatrical effect where required. The result of the changes she has made since she became head gardener is that the garden, both on the ground and in the caverns, has become a greater pleasure aesthetically. The planting is becoming sympathetic to the dramas of the tour: at one point you emerge from underground caverns full of ferns and other quiet, satisfying greenery into a contrasting and exciting exotic garden, planted with gunneras and other similar theatrical plants. But the drama is principally created by the use of quantities of scarlet nasturtiums, bright variegation (with plants such as Carex phillocephala `Sparkler’), and repeated yellow flowers of Lysimachia punctata. Quite familiar plants, but used dramatically and effectively. 7 – Plants aren’t the only attraction; gargoyle-like faces peer eerily from dark corners. Above ground, the Italian Garden is a formal garden, satisfyingly edged with purple Heuchera and silvery Cerastium (snow in summer), with a beautifully discreet artichoke fountain in the pool. The rather harsh surround to the pool is softened by a pretty self-seeding daisy, Erigeron karvinskianus, and by patterns of thyme. In the bog garden, astilbes and purple coloured plants offer subtle harmony: everywhere plants are grouped and related to each other to fine effect. The garden is full of variety, and in many places, water adds a special touch, in pools, streams and fountains. The intricacies of planting style are probably the least of John Harris’s problems. Initially all the family wanted when they moved to Dewstow was a private family garden, but the excitement of the discoveries took them into uncharted territory. They have managed, amazingly, to carry out the renovations over the last three years or so without financial assistance from any public body. 8 – Part of the garden’s great appeal is the contrast between the dark, moist underground areas and the light airy garden outdoors. In addition to the personal expense, the owners’ privacy is regularly invaded because they open the garden to the public, allowing others to enjoy it, and also to help fund its survival. Garden opening does not often create large profits, and keeping a garden of this sort is a costly enterprise, made even more expensive by opening and thus having to provide extra staffing, public safety, insurance and so on. It is a significant burden. A public used to casual garden openings for charity on the one hand and `public attractions’ on the other is often unaware of these costs. They will also have expectations which can be hard to meet – such as food, drink, plant sales and souvenirs, toilets and someone to answer queries. However, Dewstow is still essentially and foremost a private garden, and opening to the public restricts the family’s use of it. It is certainly fortunate that the owners’ generosity and interest for their garden overrides any of the more considered demands. Different owners may have different priorities, as they clearly have done at Dewstow in the past. So go and see it while you can, for fear that with time, it may vanish underground again.